Hamsters are plant-loving little creatures, and for their basic, every day meals can be found at any of your local pet stores. A majority of these mixes are made of seed mixes, and others will be basic pellet food. They will require everything that your little hamster needs in terms of nutrition. When feeding your hamster sprinkle some around their bedding so they can search and forage for their food naturally, and also put some in a small dish for easy access. Many hamsters will love to go and find the food as it allows their natural instincts to flourish. You’ll be surprised when your little hamster takes its food out of the dish and buries it underneath his bedding for safe keeping! 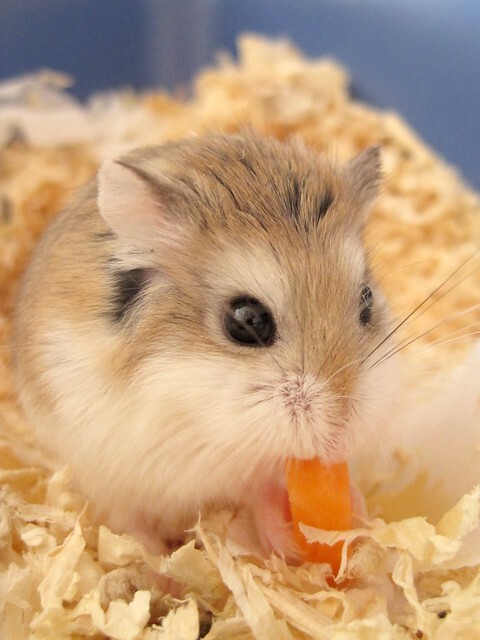 An important part of a hamsters diet includes small amounts of fresh fruits and veggies each day. While it is not necessarily needed, if you’re using food pellets or mixes, it is the hamster’s natural diet and so they are likely to enjoy the variety. When we say ‘small’, we mean ‘small’. Hamsters need very little fresh fruits and vegetables. An overabundance of fresh fruits and vegetables can cause serious diarrhea. If you find that a food causes diarrhea in your hamster, avoid giving it to your pet. Because hamsters love to eat, they’ll eat them right up without thinking twice. So it is your job to monitor their intake. other leafy greens such as lettuce, kale, chard etc. All food should be cut into small bite size pieces or crumbled. This makes the food easier to access and then the hamster can bury it for safekeeping wherever it feels is fit. Ensure that you remove any food from the cage that is likely to go rotten – such as egg. Also, provide your hamster with a full fresh drinking bottle every day. You’d be surprised how much those little guys can drink! You and your family will come to love this small but fun pet quickly. Take good care of it, feed it the right foods and the occasional treats and your new family member will stick around for many years to come! You Should Get Pet Insurance? How At Home Fitness is the Answer?